It was truly the end of an era in Limerick this week when the Dominican Order bid farewell to the city after almost 800 years residing there. 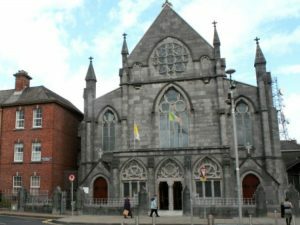 However, there was some comfort for the congregation with news that St Saviour’s Church is to remain open and will be served by a number of priests from the diocese of Limerick. The Dominican order arrived in Limerick city in 1224, setting up a church in 1227, and have been based in Glentworth Street for 200 years. At the end of the Mass, Fr Downes handed the keys to the church to Fr Eamonn Fitzgibbon, representing the diocese of Limerick. The Order announced its intention to withdraw from Limerick in September of 2014 citing “falling numbers of friars” to staff its commitments as the reason for the withdrawal from a number of locations, including St Saviour’s on Glentworth Street. The Dominicans also said last year that it was to begin a process of “re-organising our commitments in Ireland”, a move it confirmed would include a withdrawal from Limerick. Three priests who were based at the Order’s house in the city will now move to other Dominican houses around the country. In 2015, the Order currently had 125 Dominicans, just 51 of whom are under the age of 65, while some are still in training and not all are in robust health. The Dominicans plan to concentrate development on other centres in Ireland, resulting in a “process of withdrawing” from a number of locations as well as Limerick, including St Magdalen’s, Drogheda, Leeson Park in Dublin, St Dominic’s, Athy and St Saviour’s, Ballybeg, Waterford.